Bending is a stamping process that uses pressure to force the material to plastically deform. Thereby forming a certain angle and curvature shape. Commonly used bends include V-bend, Z-bend offset bend and hemming bend etc. The sheet metal bending height should be at least 2 times the thickness of the sheet metal plus the bending radius, that is, H ≥ 2t + R.
As shown in the figure below, the sheet metal bending height is too low, and the sheet metal is easily deformed and twisted when bent, which making it difficult to obtain the ideal part shape and ideal dimensional accuracy. When bending a beveled edge, the bend distortion is most likely to occur because the bend height is too small. As shown in the figure below, in the original design, since the leftmost bending height is too small, the bending deformation is likely to occur during bending, which resulting in low bending quality. In the improved design, the height of the left side bend can be increased or the minimum part of the bend height can be removed, so that the sheet metal bend does not undergo distortion and the bending quality is high. In order to ensure the bending strength, the bending radius of the sheet metal should be greater than the minimum bending radius of the sheet metal. The minimum bending radius of various common sheet metal materials is shown in the following table. Of course, the sheet metal bending radius is not the bigger the better. The larger the bending radius is, the larger the bending spring back is, and the bending angle and bending height are less easy to control. Therefore, the radius of the sheet metal needs reasonable value. In addition, sheet metal mold manufacturers tend to have a bending radius of zero, so that the sheet metal does not easily rebound after bending, and the bending height and the bending angle are relatively easy to control. 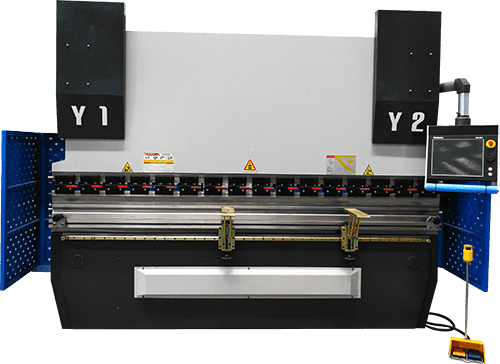 However, the bending of with zero bending radius is easy to cause the external cracking or even breaking of the sheet metal, and the bending strength of the sheet metal is relatively low, especially for the hard sheet metal material. Moreover, the right angle on the mold will gradually become smooth after a period of production, and the bending size will become difficult to control. In order to reduce the bending force and ensure the bending size, the sheet metal mold manufacturer adopts another method to add the pressing process before the bending process, as shown in the figure below. However, such a design also causes defects such as relatively low bending strength and easy fracture of sheet metal. The pressing process is a stamping process in which a partially extruded material is forced to extrude a groove on the sheet metal to facilitate bending and ensure bending accuracy. Sheet metal bending should be as perpendicular as possible to the direction of the metal fiber. 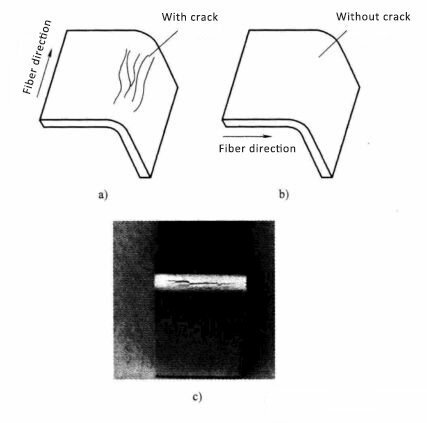 When the sheet metal bend is parallel to the direction of the fiber of the metal material, cracks are likely to occur at the bend of the sheet metal, and the bending strength is low and it is easy to break, as shown in the following figure. When sheet metal is bent, it is often because the other features which are too close to the base of the sheet metal for bending, so that it cannot be pressed and cannot be bent or severely deformed after bending. 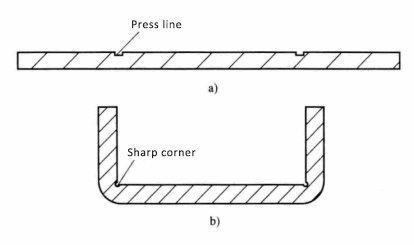 In general, at least two times the thickness of the sheet metal plus the bending radius at the base of the sheet metal must be ensured that there is no other feature to block the pressing when the sheet metal is bent, as shown in the following figure. In the original design, the offset flattening position was too close to the base of the sheet metal, which caused the sheet metal cannot be pressed and the bending failed. Another example, if the sheet metal budding is too close to the root of the bend and the bend cannot be made, the bud can be moved to the position of the base of the sheet metal, as the first design in the improved design below. 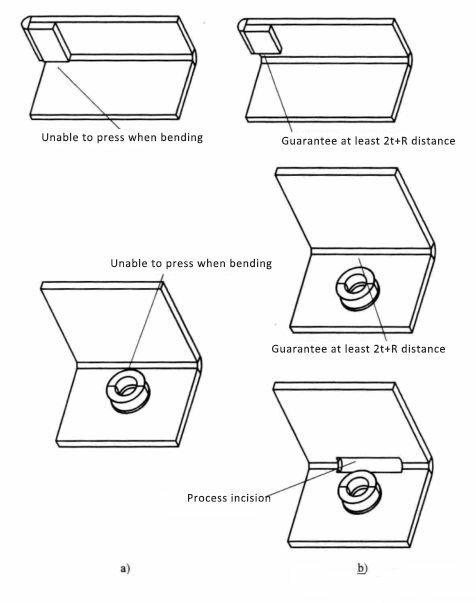 If the position of the bud and the bend cannot be moved because of the design requirements, a open cutting can be added to the root of the bend corresponding to the bud to ensure the smooth bending process, such as the second design in the improved design. Due to the existence of the sheet metal bending tolerance, in the direction of the bending of the sheet metal, a certain bending gap needs to be secured to avoid the bending failure caused by the interference during the bending. As shown in the figure below, it is a simplified diagram of a complex bending sheet metal part. The bending order is that the upper side is bent first, and then bend the right side. In the original design, there were no gaps between the two bend edges. When the upper side is bent and then the right side is bent, the presence of the sheet metal bending tolerance is likely to cause the right side to interfere with the upper side during the bending process. In the improved design, at least 0.2mm clearance is left between the right side and the upper side, which can effectively avoid bending interference. The bending strength needs to be ensured when the sheet metal is bent, and the long and narrow bending strength is low, and the short and wide bending strength is high. Therefore, the sheet metal bend should be attached to the longer side as much as possible, as shown in the figure below. Even for bend with the same function, in the original design, because the bend is attached to the shorter side and the bending strength is low. In the improved design, the bend is attached to the longer side and the bending strength is high. The more the bending process of the sheet metal part, the higher the mold cost and the lower the bending precision. Therefore, the sheet metal design should minimize the bending process, as shown in the figure below. In the original design, the sheet metal requires two bending processes. In the improved design, the sheet metal only needs one bending process to complete the bending of the two sides at the same time. Similarly, the more complicated the sheet metal bending process, the more material waste may be caused. Therefore, when sheet metal has complex bends, consider splitting a complex bend into two parts. Although this violates the principle of reducing the number of parts, it is more likely to result in lower product costs and improved product quality. Of course, such a design needs to be verified by rigorous calculations. 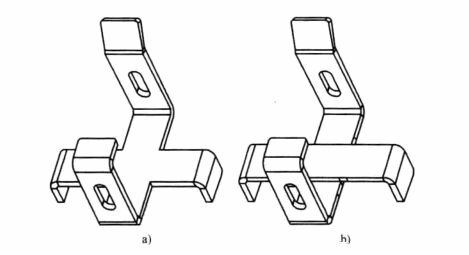 As shown in the figure below, the sheet metal part with complex bending is split into two parts, and the two pieces are assembled by rivet, self-riveting or spot welding. Many engineers must have such painful experience, why the screws or the nail holes on the sheet metal bending are always misaligned, so that the screws and rivets cannot be fixed. This is because sheet metal bending tolerances are large, especially when sheet metal has multiple bends. As can be seen from the above table, the more times the sheet metal is bent, the greater the bending tolerance. It is difficult to ensure the accuracy of the dimensions of the multiple bends of the sheet metal. 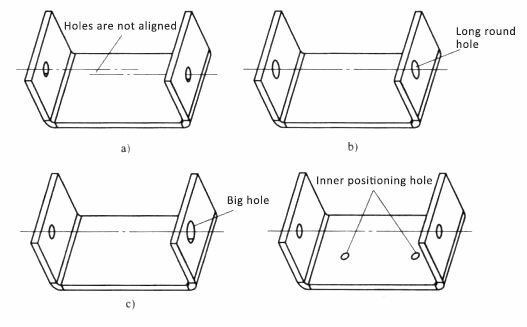 This is why the screw holes, the pull holes and the self-rivet holes on the sheet metal are difficult to align after bending. Therefore, in product design, engineers need to take into account the characteristics of multiple bending tolerances, to avoid too strict tolerances on the features of multiple bends on parts. At the same time, the design of the sheet metal should be optimized to avoid the occurrence of the following undesirable phenomena in the assembly of the parts, such as the misalignment of the assembly holes, the assembly size is difficult to guarantee, and even the assembly interference etc. Design a hole in a bend into a round hole or a large hole, allowing a large tolerance to be bent and ensuring the assembly of the part. Add two inner positioning holes, increase the internal positioning of the mold, reduce the tolerance of the sheet metal during bending, and ensure the alignment of the holes on the two bends. 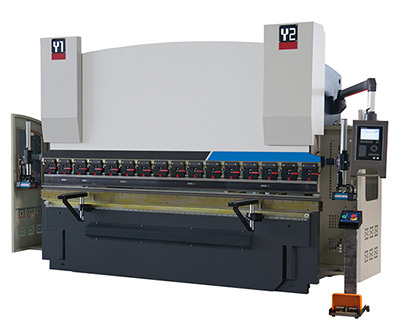 Bending first and then punching the hole, the dimensional accuracy of the two holes can be guaranteed, but this will increase the complexity of the stamping die and increase the cost of the die. Generally, it is not recommended.